Confession. 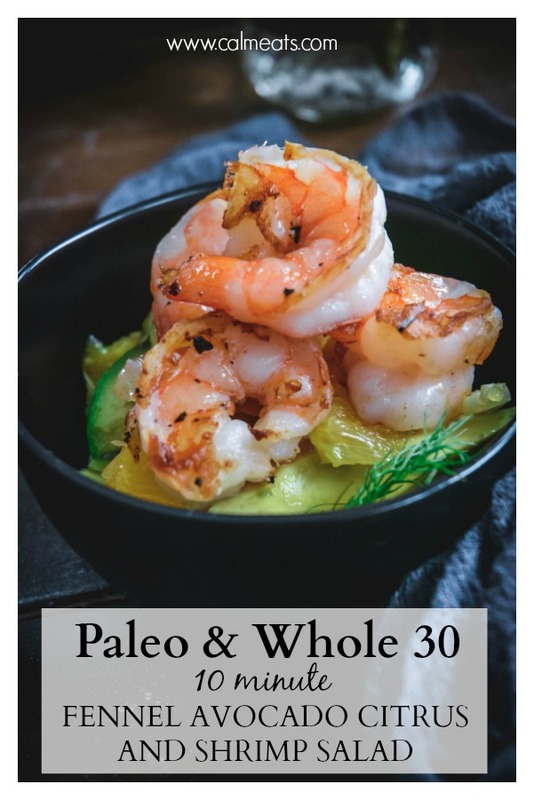 I didn't try shrimp until my early 20s - in fact, I didn't eat seafood at all until then. I know, I must have been out of my mind. The thing is, we didn't have much seafood growing up. I shouldn't even use the word much - we didn't have any. So seafood. It intimidated me and was unfamiliar so I kept my distance. My mother, who still to this day refuses to touch it, never cooked any. After all, we ate how we learned to in Romania and Germany. And the diet I adopted in my teens once we moved here included ample amount of pizza, cereal, whatever my mom cooked, more junk and then then I eventually turned to a quasi-vegan lifestyle. In a nutshell, a disaster but never included any seafood. But things changed drastically once I started college. In addition to my meeting new people I was also introduced to new food and started eating differently. No, wings from Domino's at 1am were not one of them, but there was shrimp. The first time I tried it was when friends put together a dinner. Out of respect, I decided to try one. Embarrassingly enough I had to ask for instructions. The rest is history. Today I eat seafood more than any other food. 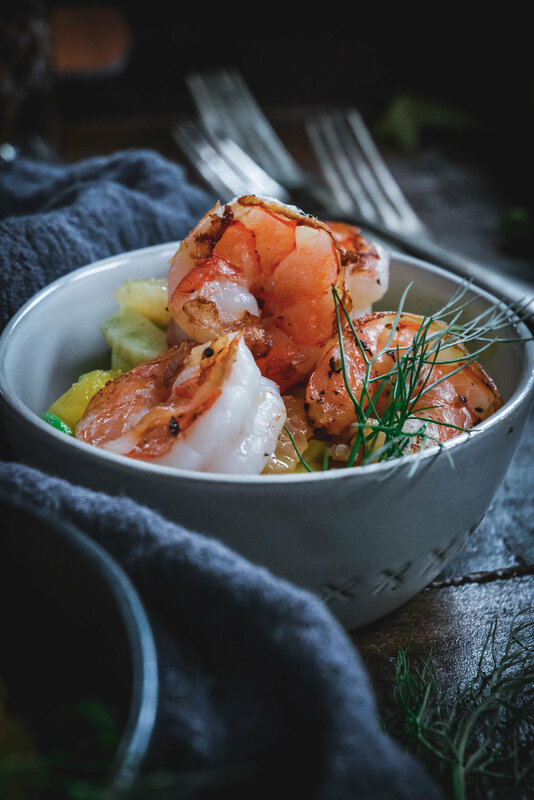 Shrimp, salmon, sardines, scallops, tuna - I love it all! 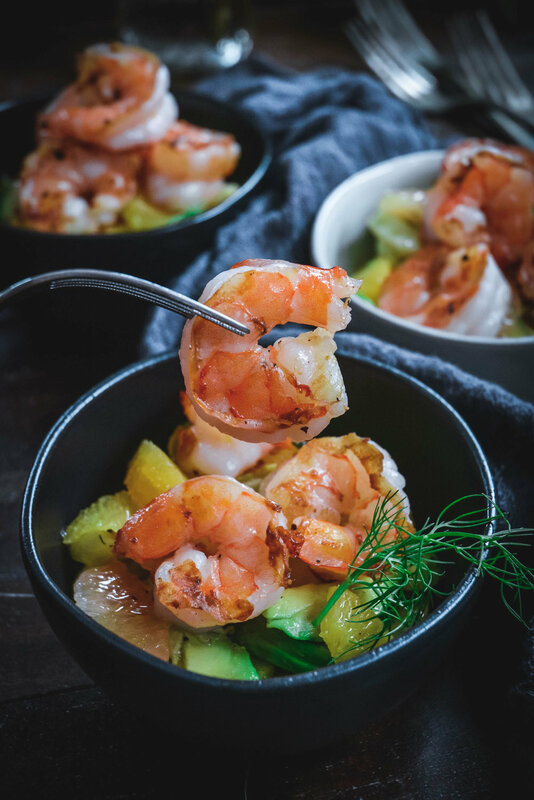 And particularly like the versatility of shrimp as it takes minutes to cook and is fairly inexpensive. 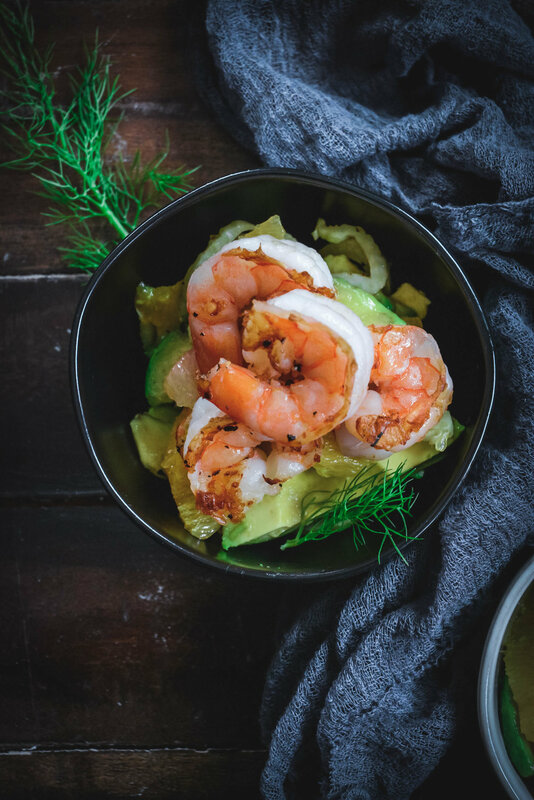 Probably one of my favorite ways of eating shrimp is with avocado and citrus. 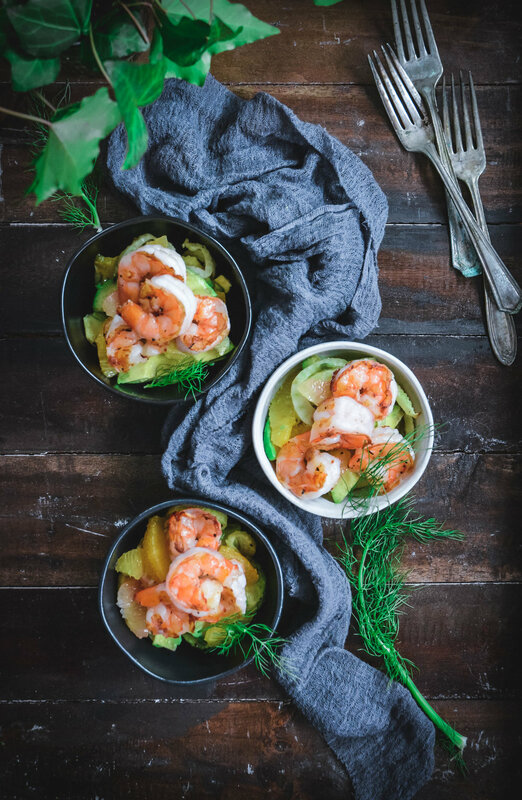 For this salad, I used orange, avocado and fennel. If you're not a big fan of licorice, roasting it for a few minutes will cut down on the sometimes overpowering taste. I happen to love fennel and like it raw or roasted. For this dish, roasting it for 10 minutes provides a nice balance to the other ingredients. It's quick to make and is the ideal lunch if you're looking for something refreshing and light. 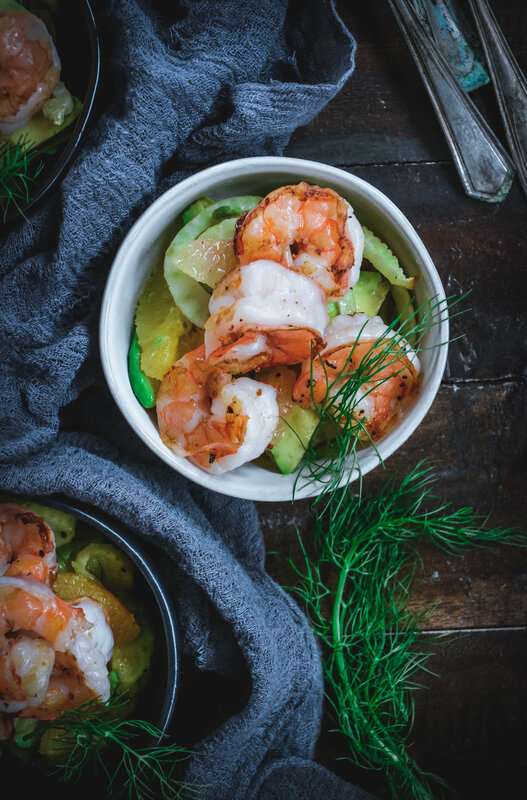 In small mixing bowl, combine shrimp, 1 tbsp olive oil, salt, pepper and toss to combine. Set aside. Meanwhile, cut fennel in half and peel outside layer. Cut into thin slices and spread evenly on a parchment paper lined baking sheet. Sprinkle with salt and pepper and pour over 1 tbsp olive oil. Toss to combine. Roast for 10 minutes stirring once half way. Next, with a pairing knife, cut peel off the orange and segment all the orange slices. Reserve the remaining orange and squeeze 1 tbsp orange juice into large bowl. Add the rest of dressing ingredients and whisk well. Add segmented orange, avocado and roasted fennel and combine with dressing. Next grill shrimp for 2-3 minutes per side until fully cooked. 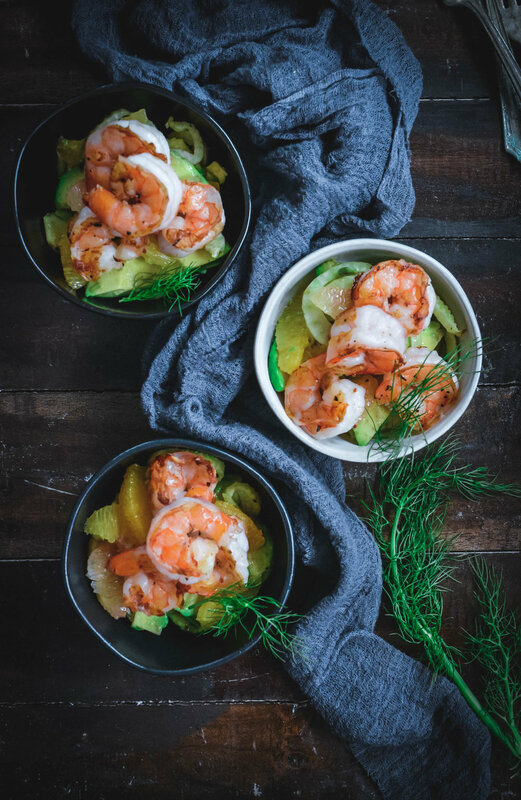 Add a good handful of salad to and top with shrimp. Enjoy!